Giant Auto Maker Chevrolet created the Chevelle 1964 model to compete with the Ford Fairlane. The Chevelle model is a mid-sized muscle car which has remained as one of the most nameplates in the general motors group sales. The body style of the model include couples, sedans, convertibles and station wagons. The models have 115-inch wheelbase which is similar to that of the 1955 Chevy. For the hardtop couples, it has two doors, and convertibles, for the four door sedans, and four-door station wagons they are referred to us as sports couples. The 1964 Chevrolet Chevelle entire production totaled around 328,400 automobiles and was the second best seller of the year. The Malibu Chevrolet Chevelle series came with a V8 engine, and other series offered two versions of the six cylinders and the V8. All the models were available in all body shapes. The interior and exterior designs were the main attraction features of the Malibu series. It came with tailored fabrics with metallic thread accents. 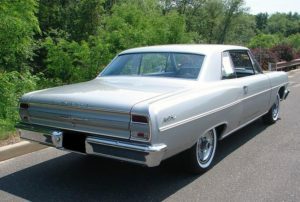 It is one of the most extensive options of the 1964 Chevrolet Chevelle with its 220 horsepower. The 1964 Chevrolet Chevelle Malibu SS option is one of the high-end Chevy designs. Equipped with a v8 engine and super sports modeling, it is one of the most favorite model among people. The car has a powerful 300 horsepower 327 cubic inch engine which make it more competitive among the rival automakers. Chevrolet made sure the car gained its rightful place by giving attention to detailed designs. The Chevelle has continued to deliver performance for relatively low prices throughout the years. When you are looking for old cars for sale in the market, then consider this 1964 Chevrolet Chevelle model. All the old cars for sale in the classic car categories, the car fall under the list. The model is available in different transmission dimensions, the 3speed manual type, 4speed manual, 2speed automatic and 3speed automatic.